Making my own cord trim. I have posted this before, but it got hacked and I had to delete it. So here it is again. 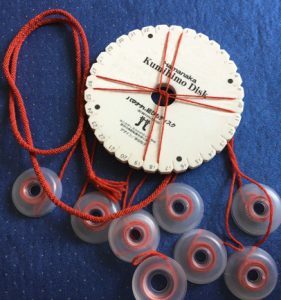 Years ago, I bought myself this clever gadget from a Craft Fair – A Kumihimo Disk and some bobbins. 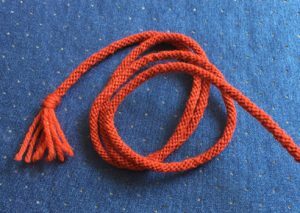 This is a very easy method of making cord trimming in any colour, so when making it for my own tapestry cushions, I can use the same colour wool as in the stitching. 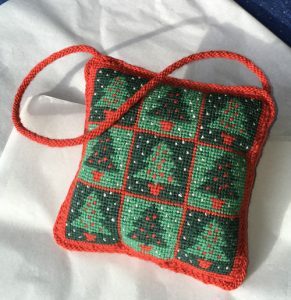 We wanted to make a Christmas Tree pincushion into a festive hanger for a door or cupboard handle. I used one of the Appletons wool shades in the tapestry and wound a couple of metres onto these bobbins. This was much too much, but I didn’t know at that point how much wool I would need. The bobbins have a soft domed top that turns inside out for winding and then you flip it back down so it covers the wool, keeps it clean and grips the wool so it doesn’t unwind until you want it to. I now know that for length, you need roughly two and a half times in wool, the length of cord you want to make. The plastic bobbins are useful to make about a metre of cord – maybe a bit more. But a full size cushion needs more than that, so I have made my own bobbins for longer cords. They can be filled up with more wool than the plastic ones. And most stitchers don’t work in a dirty environment so there isn’t really a problem keeping the wool clean! 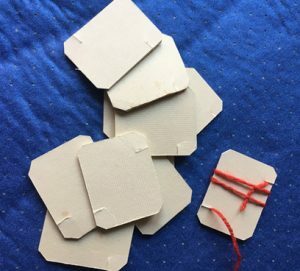 I just cut them out of thick card to be about 2 x 1½ inches or 5 x 4 cms. Two little nicks to secure the wool and snipping off the corners prevented them from snagging on each other. They worked a treat. You can go to Amazon for the disks and bobbins and YouTube for various tutorials and information. Just Google Kumihimo. The braid you make is more ‘braidy’ if you use two colours. But I felt that this small tapestry did not really need any more fussiness. So I just made red. I have plenty of left over red braid, so for the next Christmas Tree hanger that is requested, we are ready! For my next project, I will be trying more colours and maybe thicker braid. This entry was posted in Blog and tagged cord trimming, decorative cord, handmade cord trim by Wendy. Bookmark the permalink.